The threat of Brexit is creating pressure as cost of ingredients rise and force companies to the lowest cost source for packaging while ensuring quality is maintained, especially if they’re scaling production. Printsource, an industry veteran and prominent exhibitor at this year’s Speciality Show, hopes to offer a solution. “We’ve helped many food companies experiencing rapid growth, from redesigning packaging and scaling up their production to optimising print supplier costs. Relationships have started at trade shows where we’ve met with teams, experience the product and understand key challenges, following up with recommendations,” says Service Director, Paul Ptasinski. 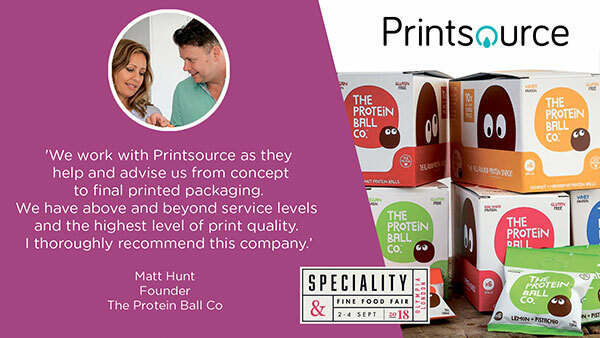 Printsource is unique in the print packaging industry, sourcing from its supplier network across Eastern Europe, UK, and Asia, enabling them to select the right supplier to get the best price. The team are obsessed with quality and manage the end to end process from artwork checks to press pass approvals, saving their clients the hassle. Get in touch to chat through some of your upcoming packaging challenges to see how they can help. This entry was posted in News and tagged Packaging, Print. Bookmark the permalink.